Originally from England, I moved to California in 2008. 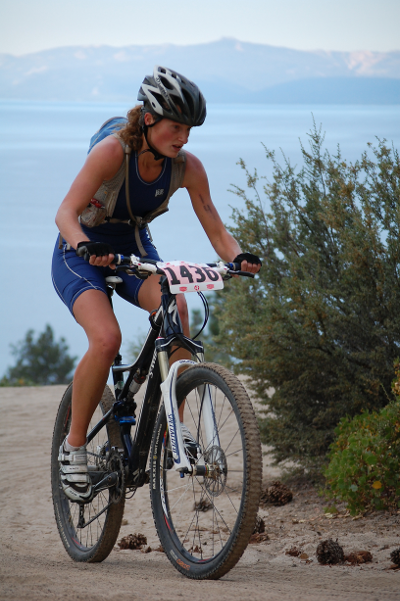 I was a novice mountain biker at the time and dabbled in running to stay healthy and reduce the stress of a silicon valley job. My boyfriend (now fiancé) took me to watch the 2008 Xterra National Championships in Lake Tahoe, and the following year I was on the start line for Big Blue’s Xterra Lake Tahoe (‘short’ course) where I won my age group and got my first Big Blue pint glass. I was hooked, and the following season, 2010, raced every Xterra I could, qualifying for both the Xterra National and World Championships. I’ve raced full Xterra seasons ever since and have also found a love for endurance mountain biking (I’ll be at the Leadville 100 this year) and trail running. As well as having the competitive gene to want to race and continually challenge myself, I love to encourage people to take the next step in discovering the cycling, running or triathlon lifestyle for themselves. I’m lucky enough to live in Truckee, CA with my fiancé and a small pack of huskies. Sian is sponsored by Innovate and by Harmony Bar.